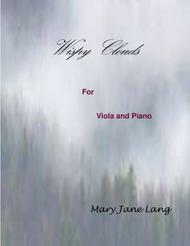 Composed by Mary Jane Lang. Instructional, Secular, 21st Century. Score. 7 pages. Mary Jane Lang #12. Published by Mary Jane Lang (S0.1843). This piece is inspired by being surrounded by actual wispy clouds while driving home from a rehearsal on a dirt mountain road. The clouds were a wonderful surprise after a great evening of making music. Since beauty of this kind is fleeting, seeing these clouds did not last long, and this was my musical attempt to keep this magnificent vision fresh in my mind. As far as performing this work you can use it in a variety of situations, such as an encore piece for a recital, or as inspiration for your students.